Israeli President’s Diagnosis — ‘Israel is a Sick Society’ — Doesn’t Go Viral in the U.S.
Rivlin is obviously referencing the teen murders of the last summer and the chants of “Death to Arabs” that resound in the streets of Jerusalem. This is the hardline rightwing society that Max Blumenthal described in his book Goliath, that Shlomo Sand has sought to resign from by stopping being a Jew, and that Nathan Thrall cites in his takedown of Ari Shavit’s usefulness to American Jews as a liberal voice when he’s anything but. And the president of the country is saying this? A Likudnik politician? As Sulllivan says, any American who said this would be instantly marginalized and smeared as an anti-Semite. Witness Blumenthal’s blacklisting by the Times, and the fact that Sand and Thrall appear in English publications. While liberal American Jews hold on to their dreamcastle Israel, with the help of Shavit and his media posse; and the New York Times gives a platform to wingnut Caroline Glick to malign Palestinian leaders. This is a very dangerous situation. Though I imagine if there’s enough controversy over the comments, The New York Times will cover them. Chris Matthews has surely seen Rivlin’s comment but won’t touch it until safe media here have picked it up. By the way, in a radio discussion on Open Source a month ago, I said that Zionism began in 1894 with Theodor Herzl hearing the chant, Death to the Jews, in Paris, and that it has now culminated 120 years later with nationalist Jews chanting Death to the Arabs in Jerusalem. That is the alpha and omega of political Zionism, which has failed Herzl’s own test, that the stranger will be welcome in Jewish society. Bernard Avishai responded that I was offering a “caricature” of the movement. I don’t think it’s a caricature; it’s a realistic interpretation of the failure of an ideology to create a better society. 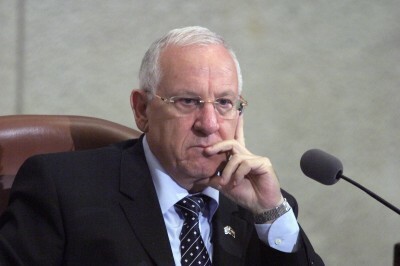 Rivlin must share something of my view, despairingly. Does he have the makings of a De Klerk, the ability to state to his fellow citizens that the project has failed and must be reimagined?